Bookish nerds are often hard to please, especially if you have little to no idea about their favorite literary genres or authors. However, if you do take the time to find out more about the person you are trying to impress, you will undoubtedly come up with a great idea. We’ve selected some of the most remarkable presents you could give to a person who loves reading. These products are excellent on all standpoints, so they might be worth checking out. Available in two colors, this type of present definitely speaks to the needs of people who prefer paper instead of pixel. 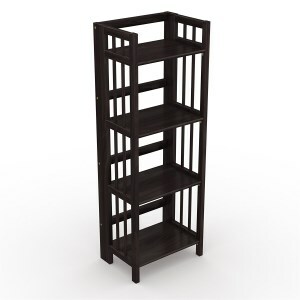 If the individual you are getting the gift for is a book hoarder and has little to no space available for storing all of the titles on his or her TBR (to be read) list, this bookcase is an amazing choice. The model is crafted from genuine wood and comes fully assembled so as to eliminate the hassle of the recipient having to put it together on his or her own. Based on the reviews it has garnered over time, we say that this unit is totally worth the investment. 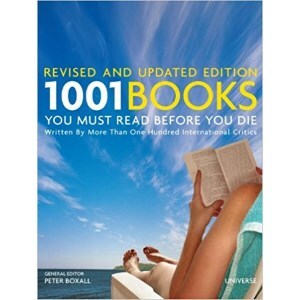 If you or one of your friends is a bibliophile, you should check out this book. It’s packed with, as its name suggests, one thousand and one novels and literary pieces one should go through before one’s demise. The list is challenging, to say the least, and not only because of the number of reads. It also raises difficulties for those who perhaps don’t appreciate the classics or who would much rather enjoy a bit of romance instead of political or psychological fiction. Nevertheless, this option makes a great present for someone who’s run out of ideas and who wants to make sure that their next chosen book is worth the effort. 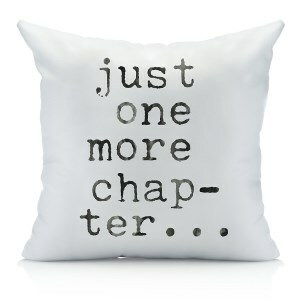 Despite being one of the most affordable products in this line, this pillow cover should also make your list. It measures eighteen inches by eighteen inches, so it’s pretty standard and is compatible with most throw pillows one might have in one’s home. As its message tells us, sometimes it’s difficult to go to sleep or get to work because the action in a novel has us wrapped up and focused and it’s difficult to find any point in real life’s chores. The cover is durable, eco-friendly, and machine-washable, so there’s practically no reason for you to steer clear of its path. When it comes to the endless debate of paper versus pixel, some people find that they are still too attached to their paperbacks or hardbacks to finally purchase a Kindle or any other e-book reader. 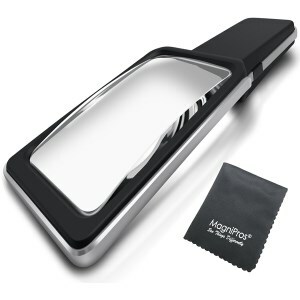 For these individuals, we recommend this lighted magnifying glass. You wouldn’t believe what a difference this device can make. It can be used for books, newspapers, as well as magazines, and it’s one of the favorite choices of people who have various eye conditions or for those whose eyesight has just gone bad over the years, as is the case with the elderly. Since it’s received over four hundred five-star reviews over time, we say it’s worth the money. This bathtub caddy tray is one of those presents that are perfect for folks who love to sit and soak for as long as thirty minutes or more. As you probably know already, when it comes to cleaning their bodies, people can be split up into two categories. Some prefer taking showers, and others love taking long baths. 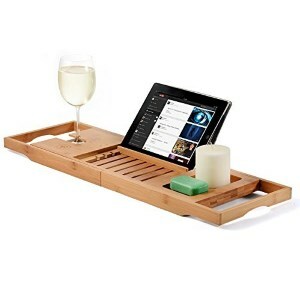 For the second, we suggest this product as it comes with a cell phone tray, a wine glass holder, and a tablet holder. Therefore, it is addressed to those who use either an e-book reader or an iPad for the purpose of reading. While with hardbacks, it’s rather easy to separate the pages and actually see what’s been printed on their inner sides, with paperbacks things can get a lot trickier. And one thing that a book lover will never want to do is damage a book cover, however tempting it might be because he or she is unable to read the entirety of the lines. 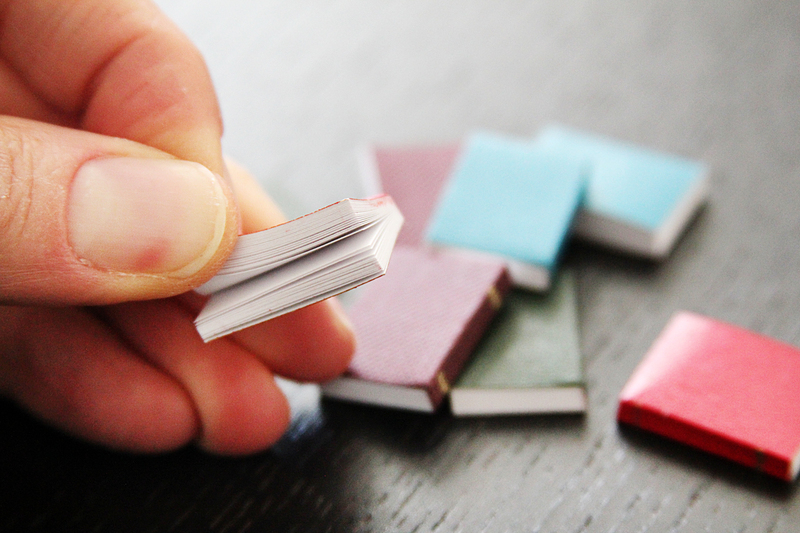 The PagePal gadget enables readers to hold their books properly and actually get to read everything printed in them, without really making an effort. The model is crafted from American Walnut, and the design looks and feels great. Frostbeard Studio is one of the most popular brands in the industry of manufacturing soy candles, and that’s because, over time, the company has developed unique scents such as those of old books, aged paper and even Sherlock’s study or Pemberley. 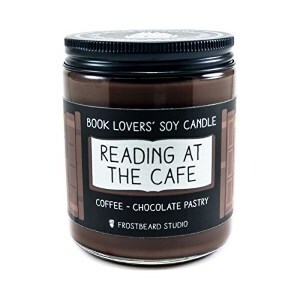 There really isn’t all that much to say when it comes to the quality of the candles, as most of the models we’ve come across have received favorable reviews, with book nerds claiming that they’re the real thing if you’re a true literary aficionado. If the Reading at the Cafe scent doesn’t tickle your fancy, perhaps the Bookworm, The Shire, or Through The Wardrobe might. Believe it or not, these socks are some of the most popular ones we’ve come across, at least in terms of presents you can get for a bookworm. They’re made from a blend of cotton, spandex, and nylon, which means that they are perfectly capable of withstanding the test of time. We do not recommend socks made entirely of cotton as they thin out over time. For each pair that’s purchased, the manufacturing brand donates one book. So, in a way, you’re not only getting an awesome pair of socks. You’re also sharing your love for books with the rest of the world. This one’s a classic, and it surely makes a great gift for someone who loves the library and goes there on a regular basis, either to study or to read. The bag is made from 100% cotton, so it needs to be cleaned with care so as to ensure proper durability. The tote is equipped with an inner pocket that can be utilized to store all sorts of essential items ranging from the user’s keys or even a smartphone. The bag is quite long and large, which is why it can be used for shopping for groceries or carrying notebooks for school. One of our colleagues owns and uses a KleverCase for her Kindle, and she loves both the design of the product and the fact that it is crafted by hand in England. 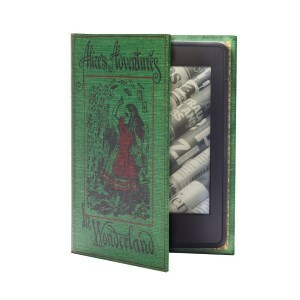 This particular cover comes in an Alice in Wonderland design, but there’s a whole series of other types of looks, too. The item is splash-proof and durable and has been manufactured of high-quality materials. Every case comes wrapped beautifully and is accompanied by a card signed by the person who made it. Most of those who’ve taken the time to review it say that it really makes their e-book reader look like a real book. The Handmade line made available by some online retailers is absolutely breathtaking, especially when it features things like this particular bookmark. The hairy little legs that the bookmark has been outfitted with automatically bring the Lord of the Rings to mind, as they look like those of any hobbit’s. 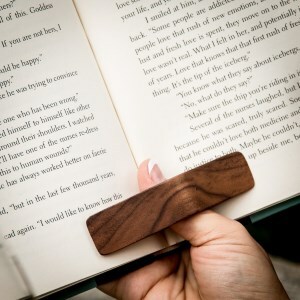 The bookmark is unique and beautifully crafted and seems to be made from reliable materials, especially judging by the feedback received by the product in the past. Also, communication with the maker/seller seems to be a breeze, at least based on what customers have to say about it. Probably the neatest thing about this unit is that its length is adjustable. Even though the makers create it in several sizes, the ring is entirely customizable as per the dimensions of the wearer’s finger. The metal is stamped with letters by hand, so that’s why all of the rings turn out looking unique in their own ways. This product is made of aluminum, which means that it is hypoallergenic and hard to tarnish. 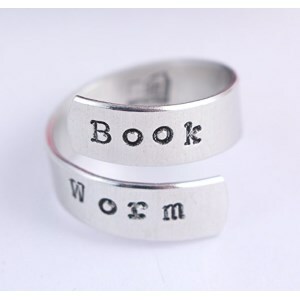 In short, with this ring, the person you’re trying to impress will finally be able to make a statement and let the whole world know about their true passion, reading. 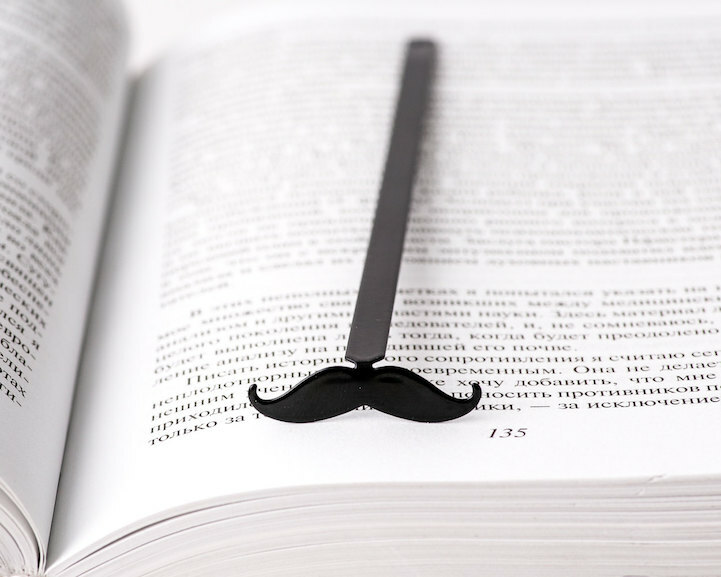 The Elysian Workshop in London, Canada, makes some of the most eye-catching accessories for bookworms. These earrings are proof. They are made from genuine leather and a hypoallergenic metal, which is why the chances of any mishaps once they’ve been gifted to the book nerd are practically impossible. 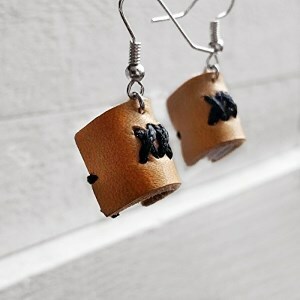 Every pair of earrings comes wrapped in an origami envelope, so there’s nothing stopping you from using it as a present wrapper. One note that we do have to make about this type of gift is that it might get to you in about three weeks after placing your order. Nothing makes a better statement than telling everyone they should leave you alone to your books. This sign does just that. Some prospective buyers might find its message somewhat unfriendly. But we, book lovers, know that sometimes, a bit of peace and quiet is just what we need to get us back on the reading bandwagon. The model is constructed from quality wood and features a black background on which white letters have been printed. Since it is made to either hang on a wall or sit in a designated place, this sign will definitely last for a good deal of time. One thing we never got round to doing whenever we read in high school is to take notes from the books we went through. Since most of the members of our team are avid readers, it’s a pity we didn’t do that. If you don’t want to be like us, check out this journal and use it to jot down all of the quotes and passages that have left a mark on you. Also, make sure to document your feelings whenever something happens and perturbs the plot of any book you’re reading. You can finally keep track of your progress and get back to your favorite notes with a nifty tool like this book journal. Much like the sign we have also showcased in this list, this hoodie is particularly designed to make a statement and tell the rest of the world what your favorite pastime really is. Every product is printed in the United States and comes in a variety of sizes, which gives prospective buyers the opportunity to select the right one for their body. Even though it might not be the best-known present ever to have been invented, we say that it might make a good gift for someone who likes to show off his or her book-loving passion. These eight-page markers are cute, easy to use, and convenient. They are extremely affordable, so you won’t even have to spend a fortune to be able to impress someone you care about. The sky’s the limit when it comes to the uses for these bookmarks, as one can even utilize them as fridge magnets or paper clips, depending on one’s momentary needs. The magnetic markers are cute and seem to work flawlessly, at least based on most of the reports from consumers that we have gone through. Some even go as far as to say that they’re everything they’ve looked for in a bookmark. This 1-inch button is more of a pun, given that it boasts William Shakespeare’s head picture and the message ‘Will Power.’ In short, it lets a book lover know that they can do anything that might have crossed their mind if they set their hearts to it. This positive message can make a difference with someone’s who’s feeling a little lost. The unit is made of metal and features a UV-protecting cover, so it has a good chance of lasting for a reasonable amount of time. From what we’ve gathered by checking out several retail sites, this particular unit can usually be acquired for under five bucks, so it isn’t exactly expensive, either. What would we be if Post-it hadn’t existed to make our lives so much easier? With their help, we can communicate with our partners, colleagues, or spouses and leave them important notes on the fridge or the kitchen table. But Post-its also come in handy in situations where one has to make notes out of a book but doesn’t have a pen or paper available. 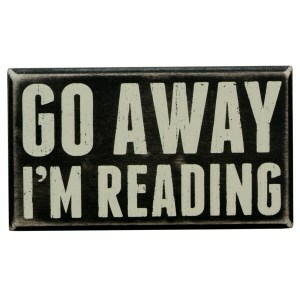 These arrows can help a bookworm do just that. The 280 flags and 48 arrows are enough to last any bookish nerd for some time or at least several reads. 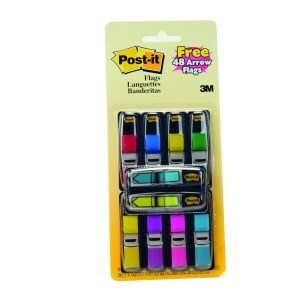 The dispenser packs that this unit is outfitted with are convenient and easy to use. This clip-on light is another neat choice, and that’s because it features six bright LED lights that will make it possible for the reader to actually see what’s written on the page of the book or the display of their device without really making an effort. 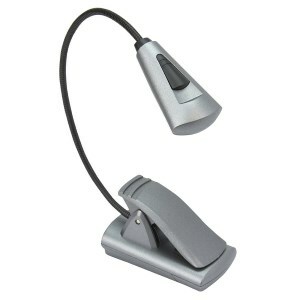 The lamp head position is adjustable. 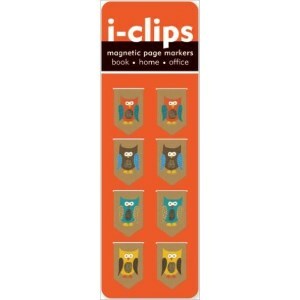 What’s more, the clip that the unit is equipped with can be attached to any type of tablet, e-book reader, or book. This light can even be utilized for DIY activities such as crafts and needlework. Besides, since it is so compact and portable, the gift recipient will be able to take it virtually anywhere. If you’ve always wanted a way to impress your book-reading buddy, we’re here to give you a hand at doing just that. We have done our own research on the matter and have found some of the most interesting and unique presents for bookworms. 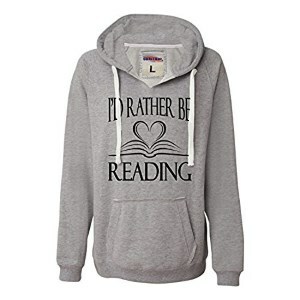 It goes without saying that the gift should be a reflection of the literary tastes of the person you’re getting it for. You also have to give some thought to the personal preferences of that particular individual and whether he or she appreciates one genre or the next. Besides, not all Game of Thrones fans like Daenerys Targaryen. Others would much likely go for a miniature representation of Tyrion Lannister. 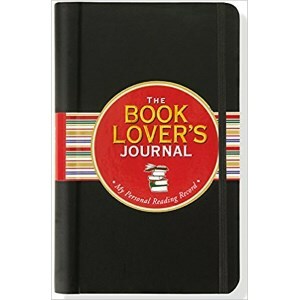 There is a broad variety of book covers, bookends, and bookbags to choose from. All you have to do is find some means to correlate them with the personal needs and tastes of that special friend. Of course, the simplest present you could get them would be a book. If you know that your friend is into one series or the next, you could just as well get the next book or that which has been launched most recently. Just make sure that they haven’t read it already. In your search for unique gifts for book lovers, you might end up feeling a tad baffled as to which one of the myriad of products available for sale you should pick. Try to devote some time to reading the following paragraphs as they can hopefully assist you in better understanding the person you’re trying to please and impress. Does the gift have to be practical? One of the things you should begin with is to try to understand whether your friend would rather appreciate a practical present or just a book that he or she can read in his or her time. If you know that the recipient is a great fan of physical books, you can get them a book stand, a clip light, or a page holder or bookmark. 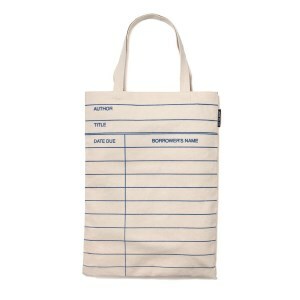 The whole idea of a cool gift for book lovers is to bring them some sort of value or the other. While some people may be great fans of functionality, others would much rather go for decorative items such as pillowcases, coasters with a unique motif such as that of their favorite authors or novels, or a sign that they can hang on a wall and let the world know about their reading hobby. In other words, you should try to find out as much as possible about the individual you are seeking to purchase something for. If you have known them for a number of years, that shouldn’t be a problem as you might have already exchanged opinions on books and TV shows. If we were to perform a classic categorization of readers, they would fall into two grand groups. Some people like physical books while others have upgraded their reading experience and now use an e-book reader. If you are aware of the fact that your friend has been meaning to purchase a tablet or a reader and hasn’t had the means or opportunity to do so, you can get them just that. Just keep in mind that some e-readers do not come cheap, and the newer they are, the more nifty features they have, and that’s why they cost a pretty penny. It stands to reason that if your buddy already owns such a device, the least thing you could do is get them a case or a stand that enables them to read even more efficiently. Stands that can be placed in the bathroom while the person is taking a bath are a no-go if you’re getting them for someone who regularly uses a Kindle, for instance. The hot and moist air might affect the device, and so it is not a good idea to opt for such a product. Don’t undermine the power of a subscription, either, as some e-books can be borrowed from online libraries. Who wouldn’t love an Audible subscription? Should it come with a particular design? The purpose of the present also needs a bit of mulling over. If the person you are buying for is an architect, for instance, he or she might be interested in browsing through a collection of some of the most imaginative buildings ever to have seen the light of day. Did your friend move into a new home recently? Does he or she appreciate coffee table books? If that’s the case, you already know what you should choose. Even better, you can always go for a cutting-edge device that fulfills two purposes at the same time. A folding book lamp, for instance, can let people know about the reading passion of your friend, but can also provide the light that’s necessary for the evening, when it’s time to lie down, enjoy a nice cup of tea and resume some reading. It’s often that readers develop strong feelings for one author or one time period. Someone who likes historical fiction, for instance, might be tickled by Victorian or Edwardian-related themes and objects. If that person’s favorite novel speaks about individuals gathering up around a table and having their 5 o’clock tea, you could just as well give them some nice Earl Grey. T-shirts printed with various messages or characters are also available for meager prices. The same goes for coasters and anything else you might want to have around the house and might not even have realized it. While some reading folk might beg to differ, authors like Jane Austen are timeless, and that’s why all of the items recalling that romantic period always make great gifts. 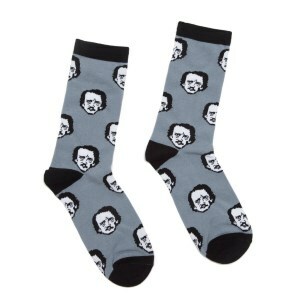 There’s nothing stopping you from considering a pair of Edgar Allan Poe socks, and believe it or not, they exist and are quite popular with readers. The sky’s the limit when it comes to getting a present for a bookworm, and you know it as well as we do.